This is back from 2011 but interesting never the less!-A.M.
Do you remember the cemetery of giant creatures that was found in Central Africa 6-24-11? A team of anthropologists found a mysterious burial in the jungle near the city of Kigali Rwanda (Central Africa). The remains belong to gigantic creatures that bear little resemblance to humans. Head of research group believes that they could be visitors from another planet who died as a result of a catastrophe. According to the scientists, they were buried at least 500 years ago. At first, researchers thought that they came across the remains of ancient settlements, but no signs of human life have been found nearby. The 40 communal graves had approximately 200 bodies in them, all perfectly preserved. The creatures were tall approximately 7 feet. Their heads were disproportionately large and they had no mouth, nose or eyes. Some of the anthropologists believe that the creatures were members of an alien landing, possibly destroyed by some terrestrial virus to which they had no immunity. However, no traces of the landing of the spacecraft or its fragments were discovered. “Scientists now say that the graves they found is probably an extraterrestrial cemetery in central Africa and it is at least 500 years old! The Swiss anthropologist Dr. Hugo Childs say, “There must be 200 bodies buried there and not a single one of them is human,” he told reporters in Kigali, Rwanda. “They are in amazing state of preservation to be so old,” he added. 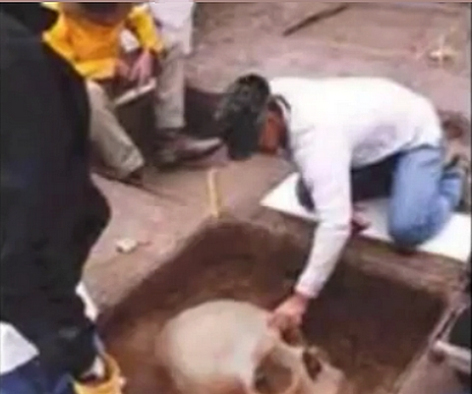 “Soil and tissue samples indicate the bodies have been in the ground since the 1400s. We’re now trying to figure out where they came from and what killed them.” Dr. Childs and his colleagues reportedly discovered the alien graveyard on a routine survey of the Rwandan jungle. Excavation reportedly revealed alien bodies stacked in fives in a jungle clearing. “The creatures themselves were much taller but skinnier than humans,” said the expert. “They stood about 7 feet tall and they were not any bigger around than small sapling trees; their heads were larger than the average man’s and they had no mouth, nose or eyes to speak of.” I assume that they communicated with one another telepathically according to the abnormal “backhead shape” of the brain vacuum and moved around like bats with some kind of biological radar.” Without further study there is no way to tell for sure what killed the extraterrestrials. But Dr. Childs speculated that the 200 aliens were part of a single landing party that encountered a deadly flu virus. “Some of them must have survived because there is no evidence of a spaceship to be found,” said Dr. Childs. “Of course, as our excavation effort continues, there’s no telling what we may run across.” Dr. Childs would not take reporters to the site, for fear of the bodies being disturbed. “This will change the world,” Dr. Childs said.